Few things are more refreshing than taking a nice long drink of cool, fresh water. When you reach for a glass of water from your faucet, do you know what it contains? Is it as cool, clear, and fresh as you think it is? Depending on where you live the odds are good that the water coming from your faucet contains a variety of chemicals that are used to kill bacteria and other microorganisms, hormones and pesticides, and toxic metal salt contamination from the pipes (1). If you are looking for an alternative water source that is guaranteed to be cool, clear, and fresh you may want to consider a bottled water like Eternal Naturally Alkaline Spring Water. Eternal water was founded by Karim Mashouf in 2008. In a press release from August 2016, the company announced that they had become the third largest premium sourced bottled water company in the United States. The company boasts one of the highest repeat purchase rates of bottled water companies at 60%. The water comes directly from one of three different natural mountain springs located deep underground in the USA. One of the three sources is located in the foothills of the Allegheny Mountains south of Springville, NY near the border of Pennsylvania. The Allegheny Mountains are a part of the Appalachian Mountain range that spans from Tennessee to Canada. The water flows over the bedrock of the Allegheny Mountains which is made up of limestone, quartzite, and sandstone. This bedrock helps to filter the water and infuse the water with natural minerals. The second source is located in the Great Smoky Mountains of Tennessee at the base of English Mountain. The water comes from a spring located 2,500 feet underground and surrounded by a 180,000-acre National Park providing isolation from pollution. The bedrock of the Great Smoky Mountains, responsible for filtering the water, is made up of limestone and granite. The third source is located in the Shasta-Trinity Alps of California. These alps run from Northwestern California to Southwestern Oregon. The bedrock of these mountains is made up of volcanic rock. The natural spring is located near a 2-million-acre national forest which prevents commercial development that could contribute to contamination of the spring (2). Each of these springs are naturally pressurized allowing Eternal water to rise to the surface and be bottled without the use of any pumps that could lead to contamination of the underground spring. Eternal water also states that in order to be environmentally responsible, they only draw a fraction of the available water out of each spring. The underground springs are incredibly vast and recharge at a rate greater than Eternal water’s consumption ensuring that the environmental impact of Eternal water on these springs is virtually non-existent. The underground spring sources that Eternal bottled water uses are naturally alkaline due to the minerals that are infused in the water as they run through the bedrock and then collect in the underground springs. Eternal reports that their bottled water has a pH level ranging from 7.8 to 8.2 (2). The water is tested hourly during production with the calibrated pH meter, Oakton Model-510. The water is also sent out quarterly to a 3rd party testing facility to confirm the pH level. While this pH level, 7.8 to 8.2, isn’t as high as some of the other alkaline bottled water options out there, the water is naturally alkaline which means it wasn’t made alkaline through ionization or reverse osmosis like some of the other water brands. If you aren’t yet aware of some of the benefits of drinking alkaline water you may want to read our article to learn more about how it could have a positive impact in your life. Should you wish to test Eternal’s claims about their water, be sure you are using a calibrated pH meter. Litmus paper test strips are designed to test fluids that have a higher total dissolved solids level, like milk or juice, than you would find in filtered water (3). While Eternal water does not have any minerals or electrolytes added in to the water, the water is naturally infused with minerals as it flows over the bedrock of limestone, sandstone, and volcanic rock. Eternal bottled water claims to naturally contain Calcium, Magnesium, and Potassium. Each one of these minerals plays a key role in helping hydrate your body and act as chemical messengers in the body. An imbalance of electrolytes and minerals in your body can lead to health challenges so it is important to find ways, like drinking good water, to replenish your body (2). The bottles used by Eternal water are plastic but they are certified BPA and phthalate free for those who are concerned about the quality of the bottles. The water is sold in 3 sizes: 600 mL, 1 liter, and 1.5 liters. 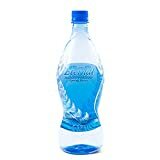 According to Eternal water’s website, you can find their water available on Amazon. In 2016, Eternal water also worked with Walmart to make their water available in 1,600 Walmart stores across the nation. While Eternal water doesn’t specifically list any celebrities or professional athletes on their website who endorse their water brand, they do make a reference to Jason Terry, a professional basketball player, drinking their water. On his twitter account, you can find pictures of him with Eternal water boasting about the hydration benefits the water offers. Eternal water has also been one of the sponsors for Style 360 NFW fashion show, providing the guests and designers with water.